When fashion designer Maya Bash began renovating a grimy auto-parts store in Tel Aviv’s Gan Hahashmal (Electric Garden) district eight years ago, she could not have known that the crime-plagued neighborhood would become “the second sexiest neighborhood on earth,” according to Thrillist, and a go-to destination for international fashionistas. Drawn by the low rents, she and other avant-garde young designers banded together as Collective 6940, brainstorming funky and fresh events to help turn the quarter into the place it is today. As they meet success in Israel and abroad, many of these designers are moving elsewhere. Bash, however, is content to keep her shop and studio on Barzilay Street, about a mile south of where she lives. The 35-year-old designer has made a modest name for herself among buyers at Paris Fashion Week. As a result, her minimalist, deconstructed garments are sold in about 10 boutiques in Japan, Italy, Russia, Denmark, the Netherlands and the United States in addition to Israel. Last year, she launched an e-commerce site to make her collections available to anyone with a credit card. That decision came from her head rather than her heart. That’s a lesson she learned through experience. A few years ago, two German women entered her store and announced they wanted to open an Israeli designer shop in Berlin. Bash and several other designers in Gan Hahashmal were chosen to realize this dream. “After six months, they came to me and said, ‘Most of the clothes we’re selling are yours, so let’s turn it into a brand shop.’ It was really good. We went to Berlin and reconstructed the shop and it was open for a year,” said Bash. “But then I gave birth to my daughter and it was very hard to manage my shop here, let alone the one in Berlin. It was a great experience but it was too much, so we closed it.” Many of her loyal clients from Berlin have become online customers. Bash agreed to meet with me during the afternoon hours she spends in her store before fetching her three-and-a-half-year-old daughter from school. 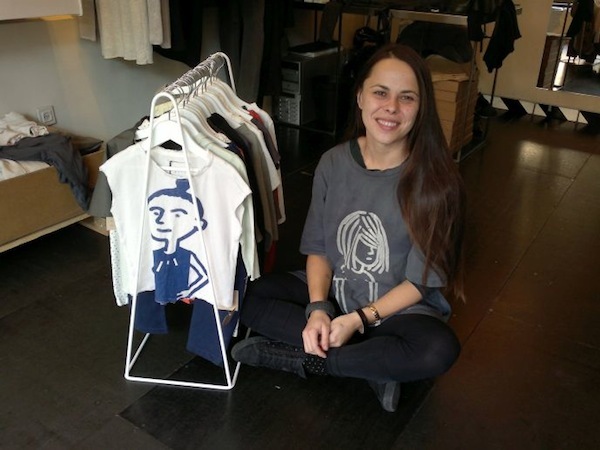 She wears a dark-grey oversize T-shirt silk-screened with the drawing of a child. “Tel Aviv is a small city, and I often see people wearing my designs. I wanted to capture some of these characters,” she explained. Bash asked visual artist Zoya Cherkassky to create stylized, whimsical sketches based on a dozen of the people she had seen wearing her clothing. The sketches were then hand-printed onto fabric and made into garments for women and kids. “I love the nature of this cycle; a person buys my clothes and then becomes the next design,” said Bash. The Maya Bash children’s line, still new and limited, gives its creator much satisfaction. But, she stays far from glam and glitter. The mostly unisex clothing Bash designs is basic above all. “My style is simple, minimalistic and deconstructed. I work from the body’s anatomical lines. I really work in an old-school way, on paper. I’m not a trendy designer,” she said. The most expensive item in Bash’s current collection is a NIS 4,300 (just over $1,350 Cdn) leather jacket with a hand-knit lining peeking out underneath. Leggings cost NIS 290 ($91), T-shirts NIS 370 ($116) and trousers NIS 590 ($186). Many of her creations have sold out. Trained at the Shenkar College of Engineering and Design, Bash favors natural or organic fabrics such as cotton, alpaca and linen imported from Japan, but is not averse to incorporating viscose, polyester and nylon where she deems it appropriate, especially for outerwear. She tries to balance her desire for growth with her insistence on remaining a small, made-in-Israel business. Most of the production is done in a factory near Rehovot, and samples are sewn in her Tel Aviv studio, where her mother does some of the hand knitting. For more information, visit eu.mayabash.com.